Contains image related functions at a high level. 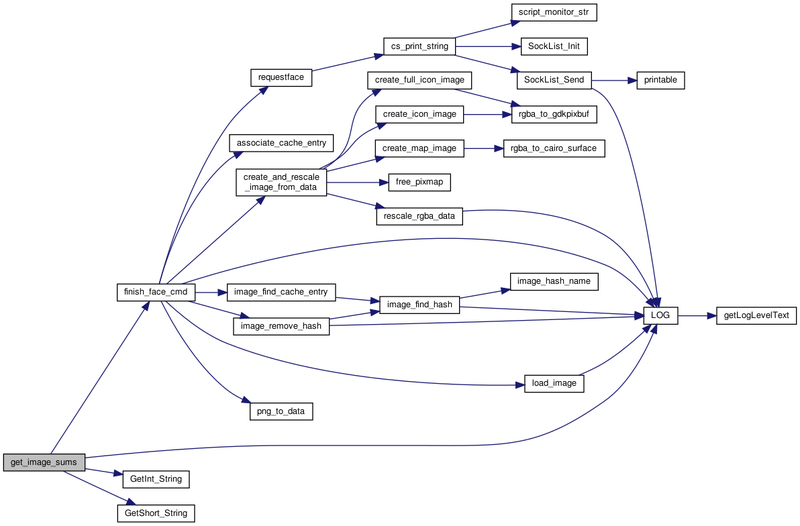 It mostly deals with the caching of the images, processing the image commands from the server, etc. Definition at line 167 of file image.c. 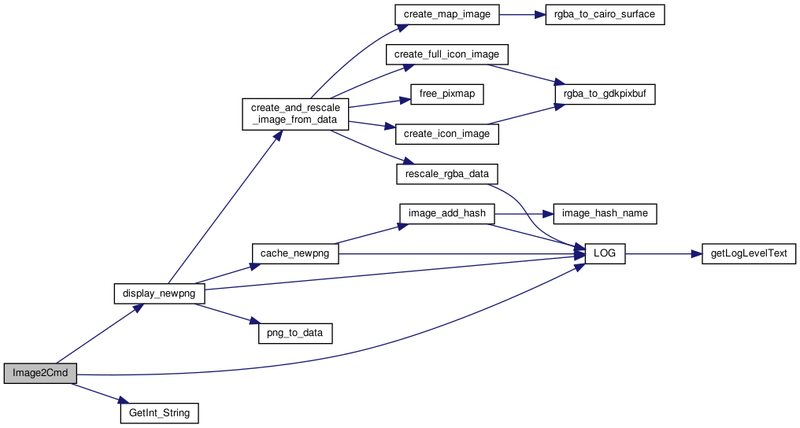 Referenced by image_add_hash(), image_find_hash(), and init_common_cache_data(). Referenced by cache_newpng(), and load_image(). Helper for display_newpng, implements the caching of the image to disk. Definition at line 570 of file image.c. References cache_dir, Face_Information_struct::facesets, facetoname, Cache_Entry::filename, image_add_hash(), LOG(), LOG_WARNING, MAX_BUF, MAX_FACE_SETS, FaceSets_struct::prefix, and ROTATE_RIGHT. This function is called when the server has sent us the actual png data for an image. If caching, we need to write this data to disk (this is handled in the function cache_newpng). Definition at line 669 of file image.c. References cache_newpng(), CONFIG_CACHE, create_and_rescale_image_from_data(), facetoname, height, LOG(), LOG_ERROR, LOG_WARNING, png_to_data(), use_config, and width. We only get here if the server believes we are caching images. We rely on the fact that the server will only send a face command for a particular number once - at current time, we have no way of knowing if we have already received a face for a particular number. References checksum, CONFIG_CACHE, finish_face_cmd(), GetInt_String(), GetShort_String(), LOG(), LOG_WARNING, and use_config. This is common for all the face commands (face2, face1, face). For face1 and face commands, faceset should always be zero. for face commands, has_sum and checksum will be zero. pnum is the face number, while face is the name. We actually don't care what the set it - it could be useful right now, but in the current caching scheme, we look through all the facesets for the image and if the checksum matches, we assume we have match. This approach makes sure that we don't have to store the same image multiple times simply because the set number may be different. Definition at line 429 of file image.c. References associate_cache_entry(), cache_dir, create_and_rescale_image_from_data(), Cache_Entry::filename, Cache_Entry::image_data, image_find_cache_entry(), image_remove_hash(), Cache_Entry::ispublic, load_image(), LOG(), LOG_WARNING, png_to_data(), and requestface(). Referenced by Face2Cmd(), and get_image_sums(). Takes the data from a replyinfo image_info and breaks it down. The info contained is the checkums, number of images, and faceset information. It stores this data into the face_info structure. Since we know data is null terminated, we can use the strchr operations with safety. In each block, we find the newline - if we find one, we presume the data is good, and update the face_info accordingly. if we don't find a newline, we return. Definition at line 706 of file image.c. References Face_Information_struct::bmaps_checksum, FaceSets_struct::comment, cs_print_string(), csocket, draw_ext_info(), FaceSets_struct::extension, Face_Information_struct::faceset, Face_Information_struct::facesets, FaceSets_struct::fallback, ClientSocket::fd, FaceSets_struct::fullname, Face_Information_struct::have_faceset_info, LOG(), LOG_WARNING, MAX_BUF, MAX_FACE_SETS, MSG_TYPE_CLIENT, MSG_TYPE_CLIENT_CONFIG, NDI_RED, Face_Information_struct::num_images, FaceSets_struct::prefix, replyinfo_status, RI_IMAGE_INFO, FaceSets_struct::size, and Face_Information_struct::want_faceset. This gets a block of checksums from the server. This lets it prebuild the images or what not. It would probably be nice to add a gui callback someplace that gives a little status display (18% done or whatever) - that probably needs to be done further up. The start and stop values are not meaningful - they are here because the semantics of the requestinfo/replyinfo is that replyinfo includes the same request data as the requestinfo (thus, if the request failed for some reason, the client would know which one failed and then try again). Currently, we don't have any logic in the function below to deal with failures. Definition at line 802 of file image.c. References checksum, finish_face_cmd(), GetInt_String(), GetShort_String(), LOG(), LOG_WARNING, and replyinfo_last_face. Definition at line 552 of file image.c. References display_newpng(), GetInt_String(), LOG(), and LOG_WARNING. Add a hash entry. Returns the entry we added, NULL on failure. Definition at line 296 of file image.c. References Image_Cache::cache_entry, checksum, Cache_Entry::checksum, Cache_Entry::filename, image_cache, Cache_Entry::image_data, IMAGE_HASH, image_hash_name(), Image_Cache::image_name, Cache_Entry::ispublic, LOG(), LOG_WARNING, and Cache_Entry::next. Referenced by cache_newpng(), and image_process_line(). This finds and returns the Cache_Entry of the image that matches name and checksum if has_sum is set. If has_sum is not set, we can't do a checksum comparison. Definition at line 272 of file image.c. References Image_Cache::cache_entry, Cache_Entry::checksum, image_cache, image_find_hash(), and Cache_Entry::next. This function returns an index into the image_cache for a matching entry, -1 if no match is found. References image_cache, IMAGE_HASH, image_hash_name(), LOG(), and LOG_WARNING. Referenced by image_find_cache_entry(), and image_remove_hash(). This function is basically hasharch from the server, common/arch.c a few changes - first, we stop processing when we reach the first . - this is because I'm not sure if hashing .111 at the end of all the image names will be very useful. Definition at line 188 of file image.c. Referenced by image_add_hash(), and image_find_hash(). 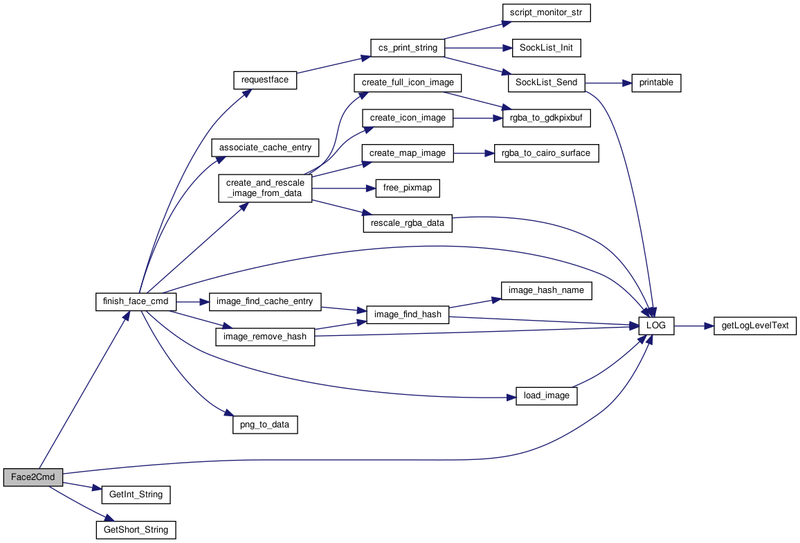 Process a line from the bmaps.client file. In theory, the format should be quite strict, as it is computer generated, but we try to be lenient/follow some conventions. Note that this is destructive to the data passed in line. Definition at line 340 of file image.c. References checksum, Cache_Entry::filename, image_add_hash(), LOG(), LOG_WARNING, and MAX_BUF. Definition at line 237 of file image.c. References Image_Cache::cache_entry, Cache_Entry::filename, image_cache, image_find_hash(), LOG(), LOG_ERROR, and Cache_Entry::next. Definition at line 359 of file image.c. References cache_dir, CONFIG_CACHE, draw_ext_info(), facetoname, FD_Cache::fd, fd_cache, image_cache, IMAGE_HASH, image_process_line(), MAX_BUF, MAX_FACE_SETS, MAXPIXMAPNUM, MSG_TYPE_CLIENT, MSG_TYPE_CLIENT_NOTICE, FD_Cache::name, NDI_RED, and want_config. Given a filename, this tries to load the data. It returns 0 success, -1 on failure. It returns the data and len, the passed options. This function is called only if the client caching feature is enabled. filename File name of an image to try to load. data Caller-allocated pointer to a buffer to load image into. len Amount of buffer used by the loaded image. csum Returns 0/unset (caller already knows if checksum matches?). Changes have made such that the caller knows whether or not the checksum matches, so there is little point to re-do it. Definition at line 55 of file image.c. References Face_Information_struct::cache_hits, face_info, FD_Cache::fd, fd_cache, LOG(), LOG_ERROR, LOG_WARNING, MAX_FACE_SETS, FD_Cache::name, and ROTATE_RIGHT. Definition at line 412 of file image.c. References Face_Information_struct::cache_misses, cs_print_string(), csocket, facetoname, and ClientSocket::fd. We can now connect to different servers, so we need to clear out any old images. We try to free the data also to prevent memory leaks. Note that we don't touch our hashed entries - so that when we connect to a new server, we still have all that information. Definition at line 509 of file image.c. References CONFIG_CACHE, facetoname, MAXPIXMAPNUM, and want_config. Definition at line 407 of file image.c. This holds the name we recieve with the 'face' command so we know what to save it as when we actually get the face. Definition at line 174 of file image.c. 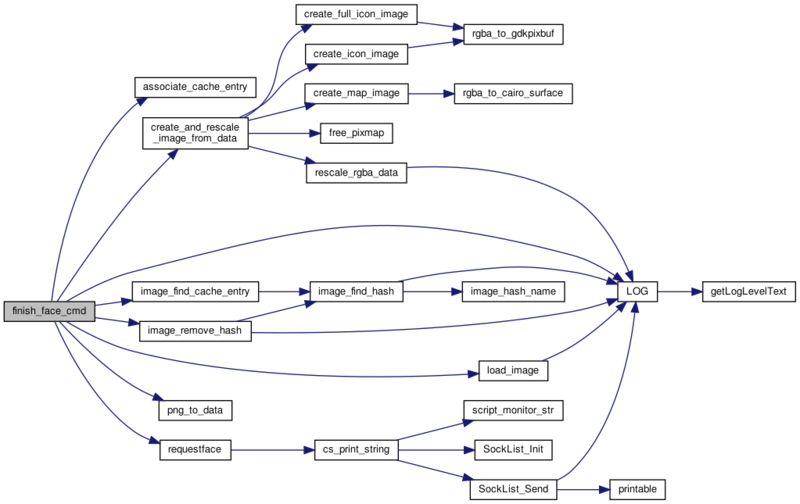 Referenced by cache_newpng(), display_newpng(), init_common_cache_data(), requestface(), and reset_image_cache_data(). Referenced by init_common_cache_data(), and load_image(). Referenced by image_add_hash(), image_find_cache_entry(), image_find_hash(), image_remove_hash(), and init_common_cache_data().